Hanoi (VNA) – Indonesia and Russia have pledged to strengthen cooperation in cyber-security and counter-terrorism as concern grows about the spread of terrorism in Southeast Asia. 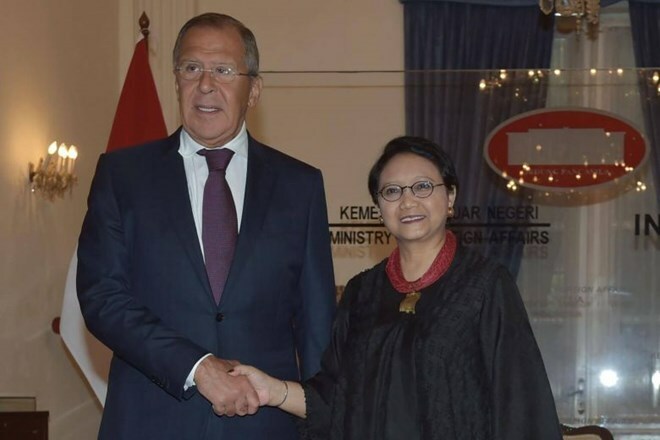 The commitment was reached at the talks on August 9 between Indonesian Foreign Minister Retno Marsudi and her Russian counterpart Sergei Lavrov, who has been on a visit to the Southeast Asian country. Speaking at a press conference in Jakarta, Russian FM Lavrov said the two countries would work together more closely to counter the expansion of the self-proclaimed Islamic State (IS). He stressed that the IS threat has not vanished and its members have been spreading all over the world, including areas close to the Russian and Indonesian borders. For her part, Indonesia FM Marsudi said besides strong ties on political and defence issues, Indonesia wants to boost trade relations with Russia. During the talks, the ministers also discussed tensions on the Korean peninsula, the East Sea issue and conflicts in the Middle East, but they gave no details. Indonesia and Russia have been both concerned about threats from the IS. Indonesian officials said dozens of Indonesians have flocked to the Philippine southern city of Marawi to fight with militants loyal to IS.